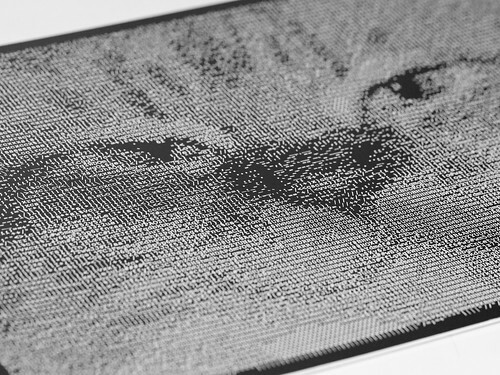 Seeing these examples reminded us of another “classic” method of making halftones: ASCII art. 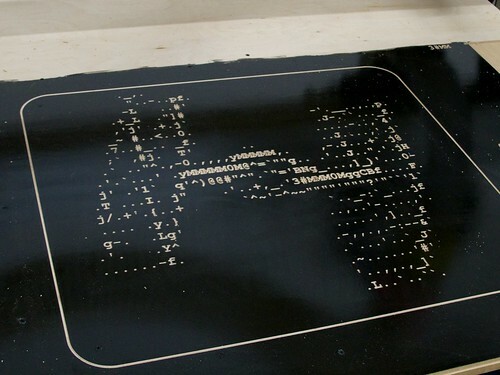 In what follows, we walk through the process of using making CNC halftones for engraving or carving from both vintage and automatically generated ASCII art. 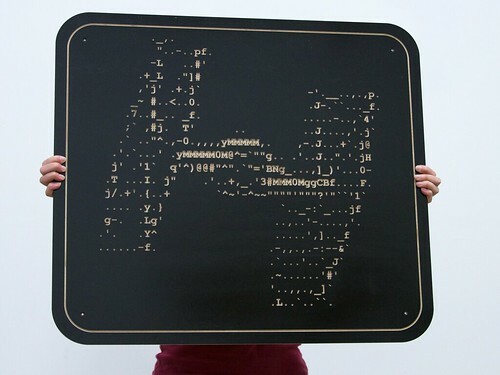 Seldom seen nowadays, ASCII art is a computer graphics technique where grayscale photos or artwork are represented by keyboard characters on a regularly spaced grid. 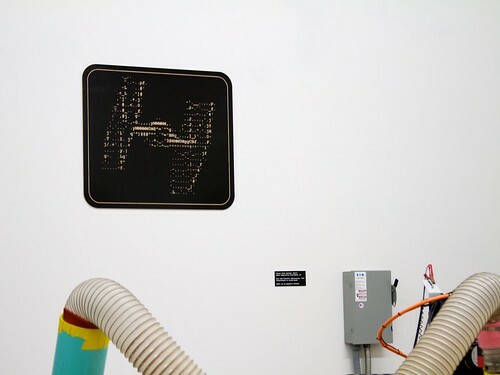 And while it does show up occasionally in the history of computer graphics, it is perhaps more important as a cultural artifact of the BBS era of computer networking. 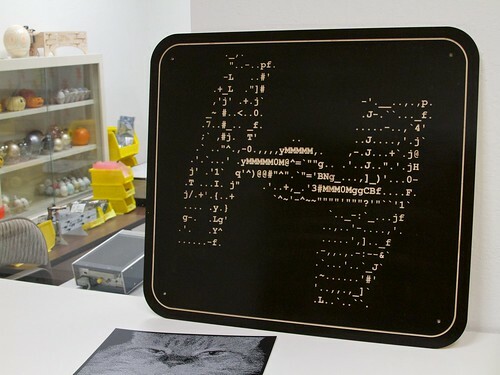 While making ASCII art was once a painstaking process of hand creation– a true art –much of what is called “ASCII art” these days is automatically generated. 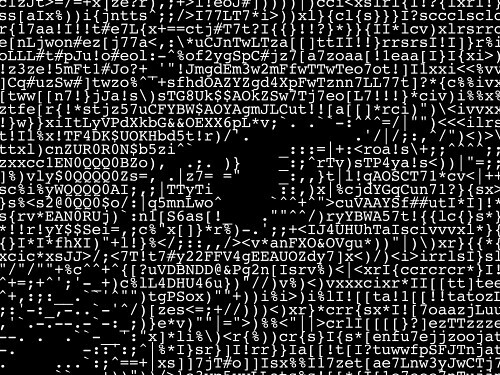 While this “automatically generated” ASCII art is pretty neat, there’s also something to be said for true “old school” ASCII art, laid out by hand, one character at a time. For this, with a smaller number of lines, we scaled it up enough that we could mechanically engrave the individual letters, using a CNC router with a V-carving bit. For the smallest feature size to be about 1/16" (or a little larger) the whole design ended up being about 30 inches across. 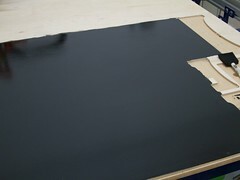 We began with a sheet of 1/4" plywood, and coated the top surface with a black polyurethane finish, to give the "black screen" effect. Carving through this reveals the white (or nearly so) wood underneath. Up close, the carved characters in the plywood reveal the inner layers and bands. These aren't a major concern, as you don't tend to notice them from a distance. 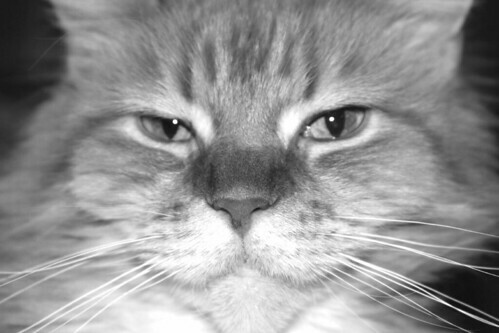 Also, zoomed in this close onto the characters, you really can't tell what the image looks like at all. And, here is what it looks like for scale-- notice the cat in foreground. This is really much, much larger than the laser engraved artwork. 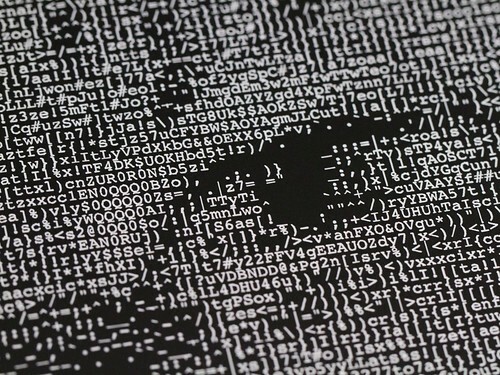 Finally, you might have noticed that the original ASCII artwork had a credit and caption embedded within it. 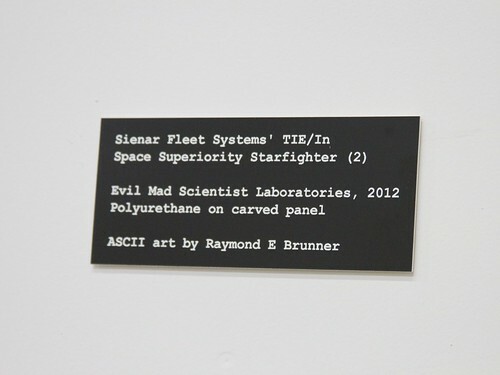 We reunited this information with the artwork when we hung it on the wall, on the separate gallery tag. 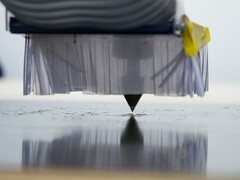 This entry was posted in Art, CNC, EMSL Projects and tagged art, cnc. Bookmark the Permalink. I’m surprised you didn’t do conventional halftoning by using a large bit (or a countersink bit) and variable depth. I’ve had some success with laser cutting halftones in various materials. Two neat properties are that they can cast half tone shadows and when backlit the otherwise “negative” image becomes a fairly visible positive. I’m surprised you didn’t mention GIMP in here. 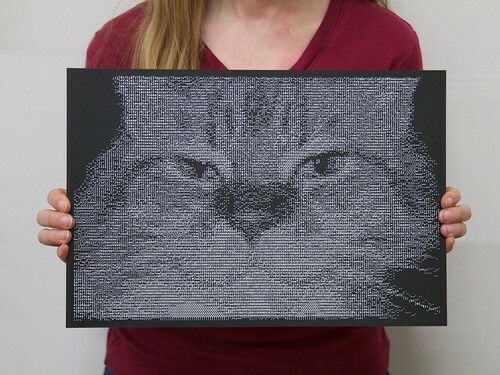 When saving a picture, change the extension to .txt (plain text) for ASCII art. 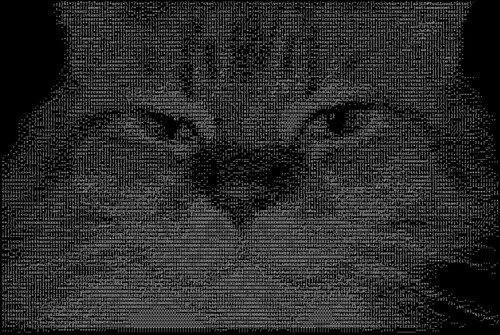 I even experimented with color ASCII art, made by creating ASCII art for red, green, and blue layers, then merging them together in GIMP again. Also, both GIMP and old school ASCII art writers take advantage of character shapes to better illustrate the images they form. 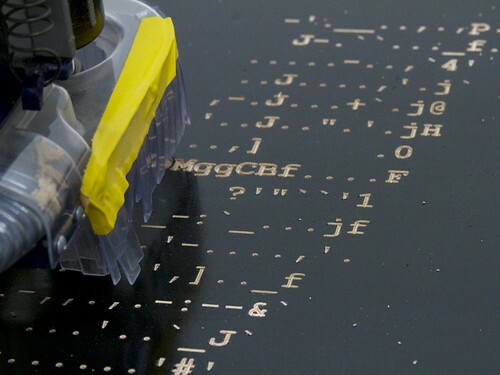 What did you use to generate the gcode for the cnc version? We use VCarve Pro by Vectric. Here’s a spin on something you’ll recognize. The pattern on the top was done with the reaction / diffusion software.